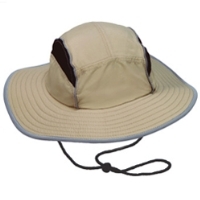 This is a new microfiber Safari hat with a 3” brim. It has mesh panels on the crown with an elastic drawstring adjuster around crown so you can size it just right. It also has a moisture wicking sweatband, chin strap, and reflective trim on the brim.